← Are You a Lumper or a Separater? TINSTAAFL is an acronym for “There is no such thing as a free lunch” and is a common theme in science fiction literature. It was the favorite theme for one of my SF literature professors. Everything has a cost, which has little to do with money. (Unless you’re Bill or Ted on an excellent adventure, and then there are no consequences). Nothing is for free. In SF, if it seems to good to be true, then that isn’t a good sign. Payment will be due. An article called “Genetically engineering ‘ethical’ babies is a moral obligation, says Oxford professor” creeped me out. The geneticist insists that we are morally obligated to screen fetuses for imperfections and make them better people by tweaking their genes. “Welcome to Gattaca” is the first thing I thought. 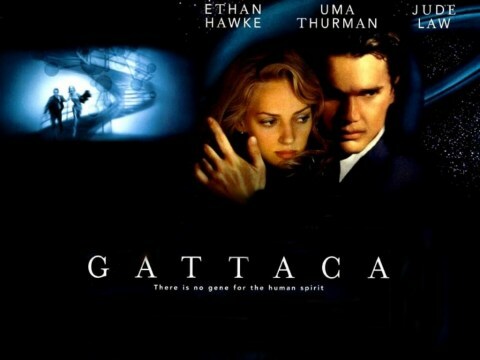 Gattaca is a 1997 SF film that stars Ethan Hawke, Uma Thurman, and Jude Law. If you’ve seen the movie, you know what I’m talking about. The film is set in future Earth when eugenics determine every aspect of people’s lives. Vincent (Ethan Hawke) was naturally conceived and born, and as a result has imperfect vision and a heart problem. His parents decide to give their second son a better life, and he’s perfect and picks on his older, weaker brother often. The government catalogs everyone in a DNA database and conducts regular screenings. DNA dictates which kinds of jobs people were allowed to have. The children who are naturally born are considered lowerclass and physically flawed and, as a result, limited to certain menial jobs. Vincent dreams all his life of joining Gattaca and going into space, but He is trapped in his place in society. urine, hair samples, and even a heartbeat–everything Vincent needs to take on Jerome’s identity. With one DNA scan Vincent is accepted into Gattaca—the database thinks he is Jerome (absolutely flawless). If you haven’t seen the movie, I won’t give the rest away. It’s pretty intense. That recent article brings up many questions about morals and ethics–whose definition of these terms is this geneticist using? His own agenda makes it sound as if he is offering utopian people. Well, we all know how utopias end. Stories about them now are called dystopias–let’s call it what it is. Sure, he’s implying that the procedure could weed out psychopaths and other undesirable character flaws and make the world a better place. That just begs the question of nature vs. nuture, doesn’t it? I don’t see a free lunch here. Let’s say he creates all these happy, friendly, smart, caring people who don’t have any negative feelings or emotions. I wonder if these eugenic people would be able to function in society. “Oh, it’s okay, my teenaged-daughter, you can stay out until 3 am, because I trust everyone has been eugenicized.” Creeeepy–borderline Stepford Wives (which deserves a TINSTAAFL Tuesday all to itself). If given the chance to alter a future child’s DNA before birth, would you do it to the extent of Gattaca? Are we adding another layer of science fiction meets reality to our lives? Are you as bothered by this “obligation” as I am?